Last summer, I took a rather extensive trip down to the mid-Atlantic to build up a large stock of photos and content to keep Labelscar going through the winter. I saw an awful lot (and was disappointed at the time that I couldn’t see more) and clearly overestimated how much I’d get done during the cold and supposedly slow winter months. So much for hunkering down with steaming cups of hot cocoa and cranking out three posts a day–I’m still working through that backlog. One of the more curious malls I visited, and one that I initially planned to post right away, is the General Growth-owned Laurel Mall in Laurel, Maryland, a suburb about halfway between Washington, DC and Baltimore. This fading mall had signs then warning of an impending renovation and revitalization, something that was very clearly in dire need. While the mall was not in awful shape and still had a fair number of tenants, it seemed to be doing surprisingly poorly given the strategic location between two major metropolitan areas. The 663,000 square foot Laurel Mall opened in 1977, although the present-day mall cobbles together pieces of two older outdoor shopping centers. Laurel Shopping Center housed a Giant Foods and Hecht’s, while a standalone Montgomery Ward was a block away. New York mall developer Shopco bridged the two with the large, two level enclosed mall in 1977, also adding a JCPenney store. By most accounts, the mall did fine through the ’80s and ’90s, although it was less-dominant than area malls like Columbia Mall and White Flint Mall. Then, in 2001, trouble began. Like many malls throughout the country, Laurel Mall was dealt a severe blow by the bankruptcy and closure of Montgomery Ward, and the simultaneous troubles of JCPenney made matters worse, causing the mall to lose two of its three marquee tenants within a year. Customers dwindled and favored other malls and the situation grew increasingly bleak, placing Laurel Mall in receivership a few years back. Today’s anchor stores are Macy’s, Burlington Coat Factory, and International Furniture Liquidators. Note that, as my photos were taken in July 2006, Hecht’s was still around. 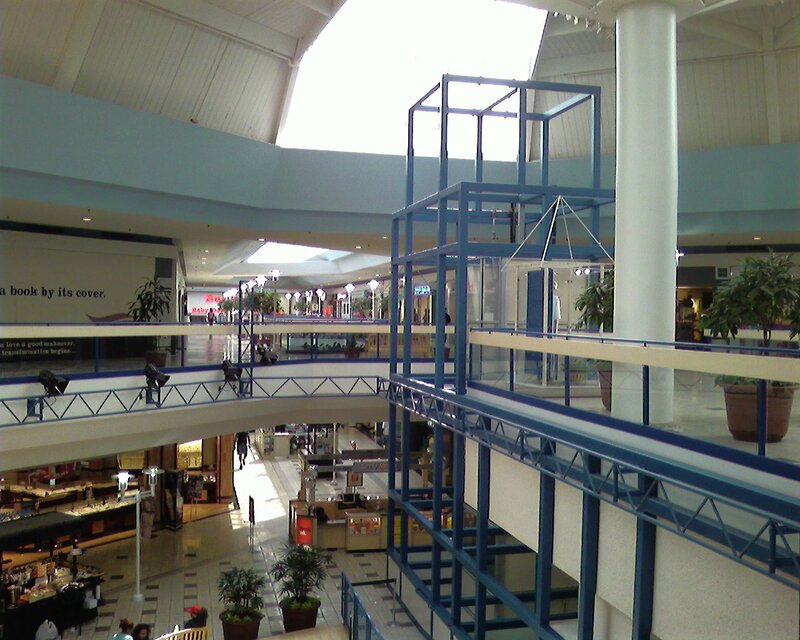 According to a recent Washington Post article, the mall is due for a major facelift. The center’s foreboding parking deck, which creates an ugly (and unphotographable) facade along US1, will be demolished and replaced by an outdoor promenade with stores and restaurants. The interior of the mall will remain during Laurel’s reinvention, and will be given a facelift: new owner Somera hope to add a bookstore, movie theatre, and other lifestyle-oriented tenants, while also incorporating decorative elements such as a fountain (it’s outdoor, kids; don’t get too excited) and a clock tower reminiscent of the nearby B&O Railroad station. It remains to be seen how it turns out, but this relatively charmless mall could certainly use something. Plagued by vacancies, a dingy appearance, and (possibly unsubstantiated) fears of crime, it seems worn out. It’s more successful (and slightly larger) than most typical “dead malls,” which is likely why its getting a deserved second chance. We look forward to seeing how the new plans progress, and are glad that, for once, a revitalization project will focus on maintaining the enclosed portion of the mall while modernizing the center. Check out the 02 picture. I think you may have slipped in a shot of White Flint by accident. ‘Cause I’m pretty sure Laurel Mall doesn’t have a Lord & Taylor. Well the sky blue hues aren’t typical in today’s malls apart the overall brightness… but the mall’s certainly not reaching sky’s limit. But it would seem this mall’s gone through an interesting timelime having formerly been a couple shopping centers but doesn’t appear to have evolved much on the appeal front. Such unusual decor here between the hexy mid-level overlooks (which are decidedly 70s aged), nu-age sci-fi lamps and that skeletal cube structure is questionable and, well, kind of pointless…. @XISMZERO, most of the mall is to be demolished in Summer 2012. Except for Macy’s. Macy’s took over when Hecht’s closed years ago. Part of the parking deck collapsed a few years ago, which is a big reason why it’s going. 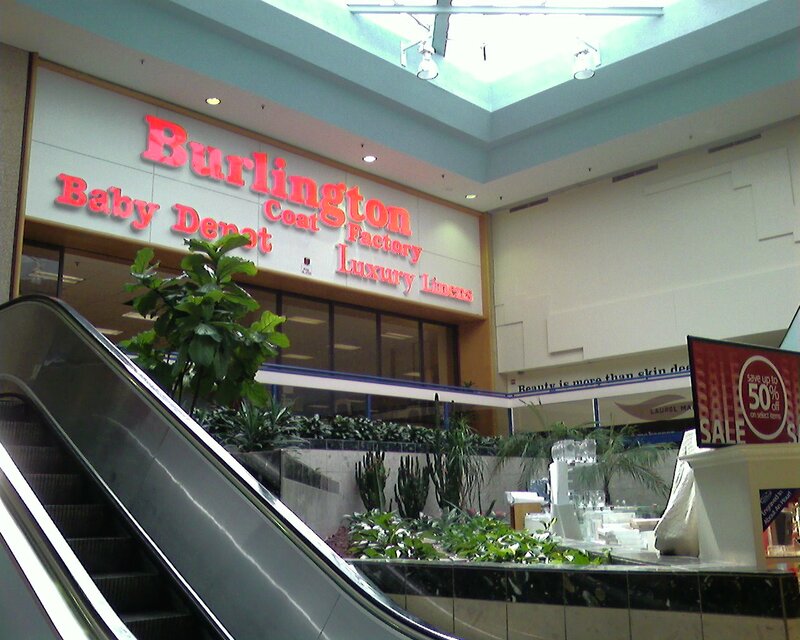 This is one of those malls with TWO classic examples of dead mall anchors: Burlington Coat Factory, AND a furniture store that oh, so obviously, used to be something else. All they need is a Steve & Barry’s. I remember this mall from years ago…haven’t been since the 1990s, but they used to have this wrap-around fountain in center court and the planter in the center of the food court used to be a fountain…outside of those lamps and the garish colors, Laurel Mall hasn’t changed much. The furniture store used to be JCPenney and Burlington Coat Factory used to be Montgomery Ward. UMD College Park is right down route 1 from the mall and if they can attract a few entertainment anchors and restaurants, they’ll get the collge students, and a few lifestyle type anchors, they can give reason for people to go here and not Columbia (which is one of the nicest malls in MD, btw)…with those changes, Laurel Mall will have a niche in the market and can be very similar to Marketfair in terms of its location, demographic and success. I’ve been reading/following what has been going on with Laurel Mall–it has potential, definitely with the right mix of tenants, it can be done. It’s nice to see, at least, that they’re still committed to the enclosed mall and they’re pouring a lot of resources towards it. 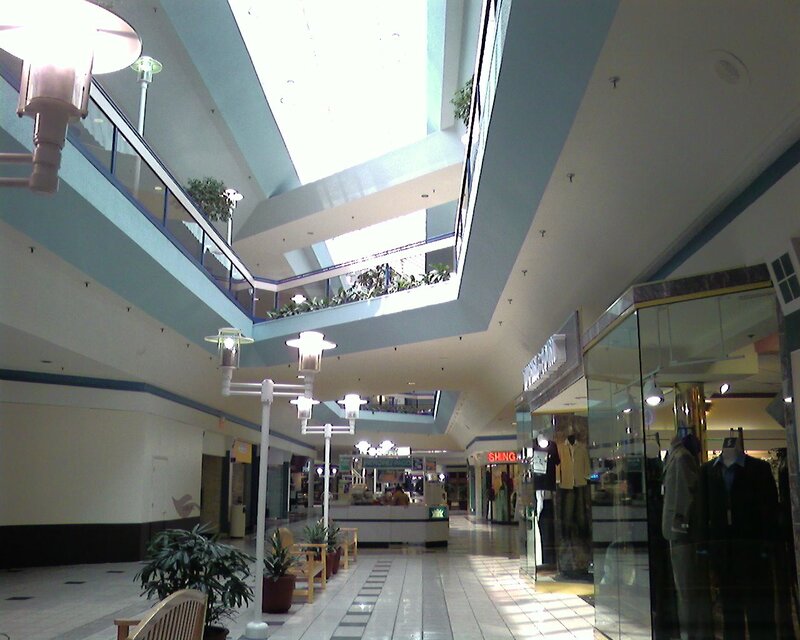 Other successful malls in Maryland include: Montgomery Mall in Bethesda & Lakeforest Mall in Gaithersburg. By some measures, Lakeforest is second only to Tyson’s Corner in volume for the DC area. White Flint seems to be holding on,as well–it’s a small mall overshadowed by Montgomery Mall. Originally, it was the upscale male in the area, now it’s a funny mix of cheap chic (H&M) and truly high end (Godiva, Bloomingdale’s), with a number of large restaurants. It’s also next to big box oriented complex that somewhat complements it. In a very different way (given the demographics), White Flint probably has accomplished the kind of nichemanship, Laurel should aspire to. BTW, the reference to White Flint in the story is a little odd–it’s too far away and too different in its market to draw stores from Laurel. Columbia is the most direct competition. Annapolis probably draws away some business, as well, along with Bowie Town Center. In terms of drawing people from College Park, Prince Georges Plaza (in its revived state) and the big boxes near Rt 1 and the Beltway would be serious impediments to that. Ah, I forgot about those malls–especially Tyson’s Corner! I should also add Arundel Mills to that list. I can see why Laurel might have a crime reputation, the mall’s too dark. Renovations should include more light-fixtures on the lower level to brighten it and maybe paint the walls some nicer colors other than the bland white. Seems like from the very first pic, that somehow, that where the planter now is that’s next to the escalator(and in front of Burlington Coat Factory) used to be another fountain in the mall? Am I right for somehow suspecting there once may’ve been one there? And it sure seems like, from reading the description on deadmalls.com, that Laurel Mall has a reputation of crime(which of course, it seems to me is probably unfounded, as it is for most malls). I wouldn’t be surprised if the structual problems with their parking deck may be scaring customers away from coming to this mall. My assumptions aside on the state of this mall, it seems like if this mall went somewhat upscale(not of course Tyson’s Corner-ish upscale, but adding a new anchor, modifying the decor/colors just a little bit, and adding a few stores that this mall doesn’t have, and possibly kicking out Burlington Coat Factory later on, hehe), this one probably easily could become successful again. Not to mention, restoring the original fountain that used to be the center/focal point of the food court(rather than just a planter) wouldn’t hurt, either. @Allan, That was once a fountain, I believe. Then it was a Things Remembered which is now gone. Prior to 1985, I don’t know about the fountain near the former Montgomery Ward, but it could be possible knowing the number of fountains that used to be in malls. While not as impressive as some other fountains (e.g. the old center court fountain in White Marsh, the never used JCPenney fountain in Woodbridge Center, the soon to be gone center court fountain in Freehold Raceway Mall), many people still stopped to look at it and sit by it. Sadly, malls prefer open space (e.g. 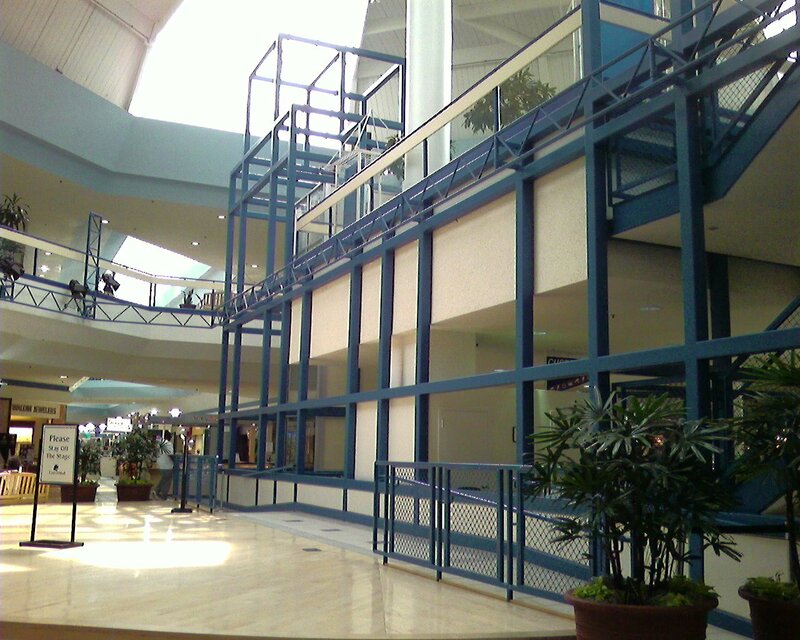 Quakerbridge Mall), planters (e.g. 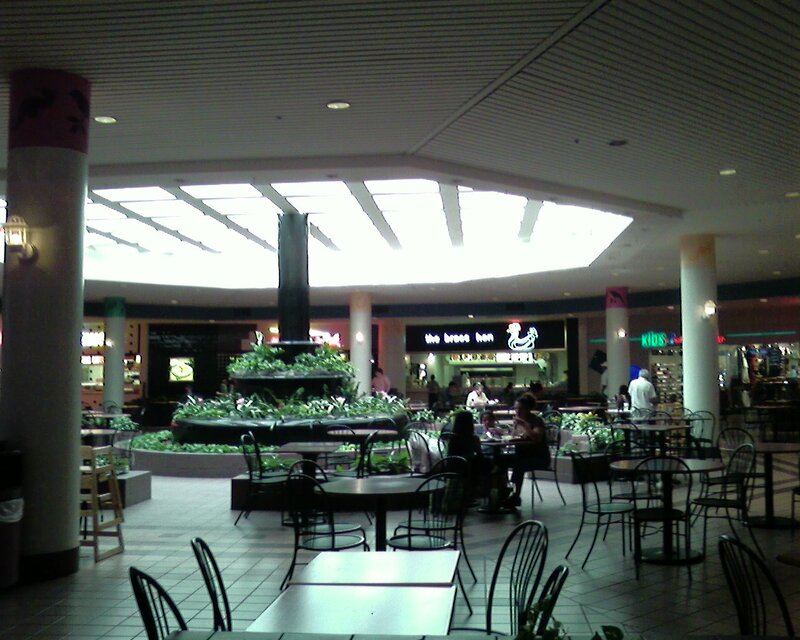 Garden State Plaza), seating areas and areas for kiosks (e.g. the upcoming renovations at Freehold Raceway Mall) rather than water features. Most NJ malls have ditched their fountains and the only ones that still have fairly large fountains are Menlo Park, Moorestown Mall Woodbridge Center and the Mall at Short Hills. In terms of other successful malls in MD, I would throw in White Marsh…its close proximity to I-95, as well as its ability to attract shoppers from DE are two big draws, plus it does have a mix of prominent anchors. I was just down there a couple months ago and it seemed to be doing very well…no major open spaces and the mall was fairly crowded. White Flint is very interesting in that it embraced entertainment tenants and restaurants (Borders, Dave and Busters, Cheesecake Factory) to not only survive, but thrive; similar to Marketfair in Princeton…right in the shadow of Quakerbridge (and a much larger Quakerbridge by 2010 with its upcoming Neiman Marcus/Nordstrom addition) it is very successful as an indoor lifestyle/entertainment center in that has a BN, stadium seating movie theatre, upscale fashion stores such as Anthropologie, as well as 3 happening restaurants/bars. I see no reason why Laurel Mall can do the same thing: bring in a Barnes and Noble, big movie theatre and attract restaurants like Champps, PF Changs and Dave and Busters (probably not D&B’s b/c they are arlready at White Flint and Arundel Mills, but they could use one in NoVA, but I digress), marke the mall as being the entertainment center of Howard County and the place will thrive! Don’t forget the pull that Arundell Mills has on the area. Most UMD students go up there, or maybe to downtown Silver Spring or DC for entertainment. The Mills is a real quick trip up 95 or the Parkway from CP, and it’s alot less dingy. Truth be told, I was there Saturday to see Grindhouse. With enough restaurants to compliment the movie theatre that are different from the Mills eateries I think they could make a go of reviving Laurel Mall. Right now the place is outright scary. Over half of the store fronts are borded up and alot of the rest are chinzy, cheap and very stereotypical “gheto” stores like a airbrush tshirt place no in a kiosk but in a full store front. BTW, don’t confuse “gheto” with “black”. The Mall at Prince Georges, Beltway Plaza, Capital Center and Bowie Town Center all have a majority black customer base and they’re all far nicer than Laurel Mall these days. When you can’t even hold onto McDonalds, you’re in trouble. I live in Laurel very close to the mall. Laurel in recent years has become one big strip mall. There are shopping centers on almost every corner. I think this is also partially to blame for the malls decline. Many of these little shopping centers already have the stores that would populate the mall. Recently, they did a big spread in the Laurel Leader Newspaper about the vision for the mall. Apparantly, it will have a new facade–along the lines of a row of buildings, like an old main street. Very gitchy. Currently, behind the mall is a huge new development of mixed use condos. Retail, office and residential. The mall will reflect the look of this development. I don’t think the mall is crime ridden–kids don’t even hang out there anymore. Its a very quiet space. I go in there every so often. There are enough stores left to suit my needs. Its so nice and peaceful, no crowds, no obnoxious teens hanging around. It is sad to watch its decline, but it seems rejuvenation may only be around the corner. I’ve been a resident of Laurel for 18 years now. The mall has truly fallen, fairly gradually and steadily, on hard times. I like the Sontera/General Growth plan a lot. While it’s common for each department store retailer to own its own stores, this has been a complicating factor to doing anything significant. All of the property on the Burlington Coat side was owned by one family — who recently agreed to sell to the new mall owners from what I understand. I would think that would open up new possibilities that were sort of unspoken when they announced the renovation plan. The local demographics are too hard to ignore — and General Growth should be able to find a client mix that will complement the Mall in Columbia, not adversely pit the two against each other. I’m convinced that Macy’s will then “turn around” and either expand or significantly remodel their store (maybe move to the BCF side?). There’s also new talk about integrating a new community library somewhere there. The city leaders are definitely behind the plan — I think it has an excellent chance of succeeding. I think the renovated Laurel Mall (to be renamed) will be a huge improvement and will attract people from the community. It may not draw customers from Columbia or Arundel Mills but people that live in or around Laurel will shop there. As nice as Columbia and Arundel Mills are in terms of stores, they are so crowded that I won’t usually go unless its and odd time. Its impossible to park at either mall. I think we will all be pleasantly surprised at the changes to come in the Laurel Mall. I can’t wait to see what happens over the next year or two. When I moved to MD in 1985 Laurel Mall wasn’t too bad of a mall. It had all the anchor stores Hecht’s, Penny’s, and Wards and many of the national chain stores. Because of its small scale it was a nice place to take the children to without them complaining too much. I’m not certain when the decline began, but after Penny’s and Wards closed, the mall took a nose dive. The last time I was there there were few national chain stores remaining and like the thread above states, its due for an overhaul. 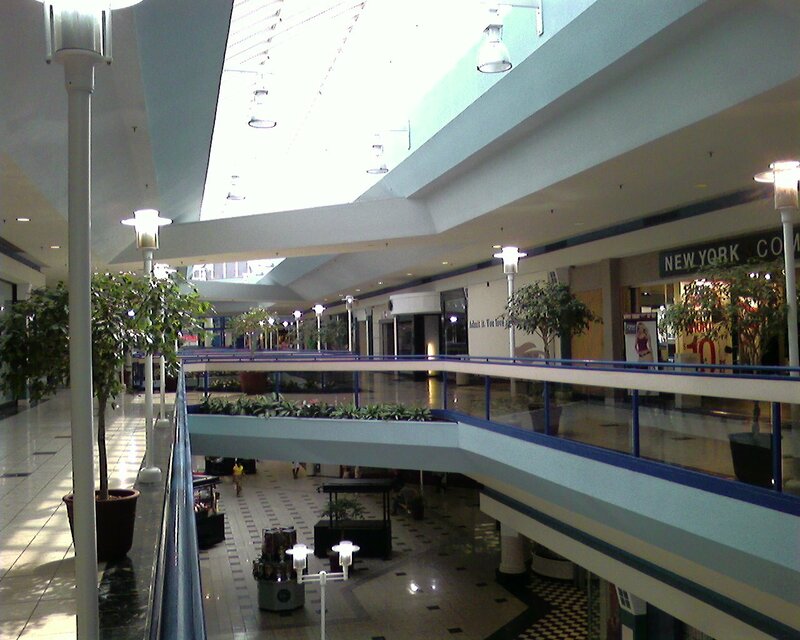 I’m surprised nobody has written about Glen Burnie Mall. It’s one that was on the brink a few years back, but has made somewhat of a comeback. As for Arundel Mills mall, I live near it, and it is a ghetto mall. Nice to visit during the week, but stay away on weekends when the bus loads of people from Batlimore arrive. Crime goes up on weekends as does the unruly behavior of the teens who seems to think anything goes. After driving past the mall this weekend, I saw nothing new there and apparently, the construction hasn’t started…the date given by GGP is 2009…we’ll see. The official name is now Laurel Commons. FYI: the center is not owned by GGP, just managed as part of their 3rd party portfolio. Somera is the actual owner. So what did IFL replace? International Furniture is the old Penney’s, Burlington is the old Wards. This is so sad – I remember a big happy lunch treat for me was to go to B. Dalton, get a copy of The Economist, and then try to find a place at the food court to eat – it would be so crowded. I bought my first ‘grown up’ curtains at the Penney’s. I made my very first credit card purchase at the mall. I had my ear pierced at a kiosk in the middle of the mall. It seems like a sad old friend; I hope they can liven it up. You all are seriously mistaken! I don’t know if you all are unaware, but in late November, Annapolis Mall finished a huge expansion and renovation and became one of the largest Malls in the state. It has VERY high end stores, and is very upscale. Altough it is only one level, it has all the palm trees, decorative elements, etc. that Columbia Mall has, but I feel that the Annapolis area has a higher class society appeal. New stores include, Ruehl, H&M, Pottery Barn, Austin Grill, Noodles & Co., Sephora, Garage, HUGE new and American Eagle, and SO many more stores! The only thing I dislike about Annapolis Mall is that it doesn’t have the MUVICO movie theatres! If Annapolis got rid of Bowtie and did a contract with Muvico, LET me tell you…Annapolis would be the PERFECT MALL!!!! I’m surprised that no one has mentioned the revolving stores that were in the middle of the mall. This is where the elevators in the center now are. There was a circular platform that rotated with I think 4 pie shaped stores. A novel idea that didn’t work. The mechanism broke often. Eventually the stores were made stationary. Then the whole thing was taken out. And of course it USED to be linked by a pedestrian bridge to the open air Laurel Plaza just to the North. Whose claim to fame is being the place where George Wallace was shot in ’72. 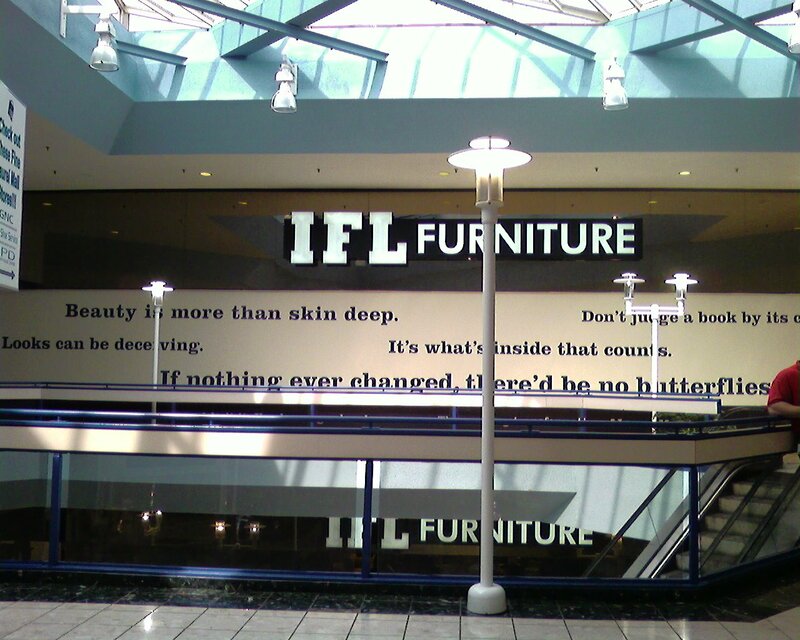 Does anyone know the name of the international furniture store in laurel mall? I grew up in the Laurel area, and was there when the mall opened, on my birthday, on October 11th, 1977. Later, I moved into some townhomes that backed up to the enclosed mall. I fear that some of the decline in the Mall reflects the changes in the demographics in nearby and the more upscale alternatives available, e.g., the Mall in Columbia. I escaped my townhome there as more of the homes turned into rentals and the “feel” of the neighborhood changed. I moved north of Laurel, in Howard County. While the Laurel Mall was an easier drive, the traffic on the Route 1 corridor made it a nightmare to get to on weekends, and the retail available just didn’t compare to the alternatives. Curiously, I now live in New Jersey in Lawrenceville, and often visit Marketfair in “Princeton”. The last thing that comes to mind as I walk through Marketfair is the Laurel Mall! From the parking, to the location and ease of access — not even close. Trying to attract upscale stores to Laurel mall is going to be tough! Even when Hecht’s was there, they had a lower grade of merchandise than in Columbia due to the different demographics they though they were attracting. And so beings a declining cycle. On the other hand, when I’m back in the Laurel area to visit friends and family, I very often stop into the Harbor Freight store in the open shopping center part of Laurel Mall. I live very close to Laurel mall and I remember going to there all the time when I was a little kid. It was very populated and there were many stores there that seem to have been taken down. I remember going in to the arcade a lot with my brothers, going to the food court to get ice cream, going to the pet store, it was such a great place to go. Now me or my family hardly go there anymore because it’s not great anymore. The only people who seem to go there now are teenagers, mostly when they get released from laurel high school they just walk to the mall to hang out. I can’t believe this mall has had the trouble it has. Great location, other parts of Laurel are doing well. It must be mismanagement. I am a realtor and I need things here to be doing well. So sad this mall is becoming an eye sore. I hope they can do something with it. Needless to say, nothing at Laurel Mall made the list, but maybe if they get their act together, that could change. I never saw the mall. I do remember the Laurel Shopping center where Wallace got shot. It was a small strip mall, and I remember liking it. Big malls make me claustrophobic. It saddens me to see the strip malls built so abundantly, and then go belly up. Is it greed ? No wonder they go out of business. I avoid cookie cutter malls. They have the same old overpriced franchises. And I hate paying a buck fifty for a cookie with a piece of paper wrapped around it. There was never a fountain near Burlington Coat Factory. I remember the revolving stores. I thought it was so cool. I happened to be in Laurel on November 1, 2009, so on a whim I took a walk through Laurel Mall. It was a Sunday afternoon, but I am doubtful the mall is much busier at peak time. The discount furniture anchor is gone and has been since at least 2008. The Burlington Coat Factory anchor is still there, and the U.S. 1 side had some remodelling done in the past few years. When I last visited the store in December 2005, the only outside entrance that was open was the remodelled one; I am guessing that is still the case. The Macy’s (which replaced Hecht’s in 2006) is still there, although I am not sure how well it is doing. The parking lot, which is so expansive it was probably never full even at the mall’s peak, features fading lines. As Arthur stated, the north parking deck is closed, while I was not feeling adventurous enough to check on the south parking deck, on the U.S. 1 side. The old Montgomery Ward auto shop at the corner of Cherry Lane and Fourth Street has been boarded up for at least six years. Of the 100+ shopfronts in the mall, at least 80 are either gated up and empty or boarded up with promotions for Laurel Commons (see below). Given the state of the mall, the remaining chain stores are somewhat surprising. I remember seeing the following: Payless Shoe Source, Bath and Body Works, Claire’s Accessories, General Nutrition Center, and Lady Foot Locker. The remaining tenants are non-chain. Among the notable non-chain stores are a tax preparation shop, a furniture store that looked like it was having a clearance, an indoor skate park, a few clothing stores, and an African knick knack store. The only place kiosks remain is in the center of the mall, where the jewelry stores like Kay’s used to congregate. The most depressing part of the mall, though, is the food court. 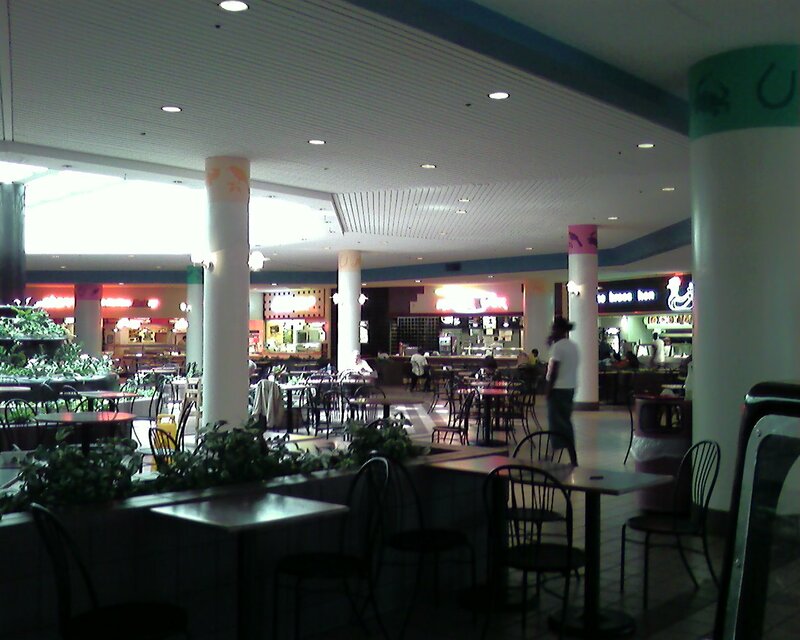 When the mall was not yet decrepit in the mid 1990s, there were eight eateries, most of them chains such as McDonald’s. Subway, Sbarro, Boardwalk Fries, and Orange Julius. There was also a non-chain ice cream shop and a Chinese food shop. Now, there is ONE non-chain sandwich shop. All of the tables and chairs are still present, which combined with the very low activity would make it a good place to study except for the very dim lighting. In the late 2000s, the mall was slated to be replaced with Laurel Commons, one of those lifestyle centers featuring a movie theater multiplex, stand-alone restaurants, and one of those faux Main Street walkable looks. You can see the plans at the Laurel Commons website (http://www.shoplaurelcommons.com/lc/home.html). Notice the dates on the website, 2007, and you can probably figure out this never happened thanks to the bottom falling out of the economy. Whether these plans will come to fruition in a few years once the economy improves is anyone’s guess. I lived in Laurel from 2002 – 2004. Laurel had a lot of stores when I lived there, and it has even more stores now, but the mall was a graveyard. It didn’t take long for me to flee to Arundel Mills or Bowie (I loved, loved, loved Bowie’s town center) or Columbia for my shopping needs. The area has potential, but crime is a problem for Laurel in general and as another commenter mentioned, getting in and out via Route 1 is a chore. I think the downfall of the mall can be attributed to when they put in speed bumps. They didn’t put in normal speed bumps. They put in the dreadful catercorner things that gave you whiplash, every time you were unfortunate to drive over them. I remember the old Laurel Mall. And when it was a big deal to hang out there on Saturday afternoon. Now the place is so decrepit I don’t go anywhere near it. 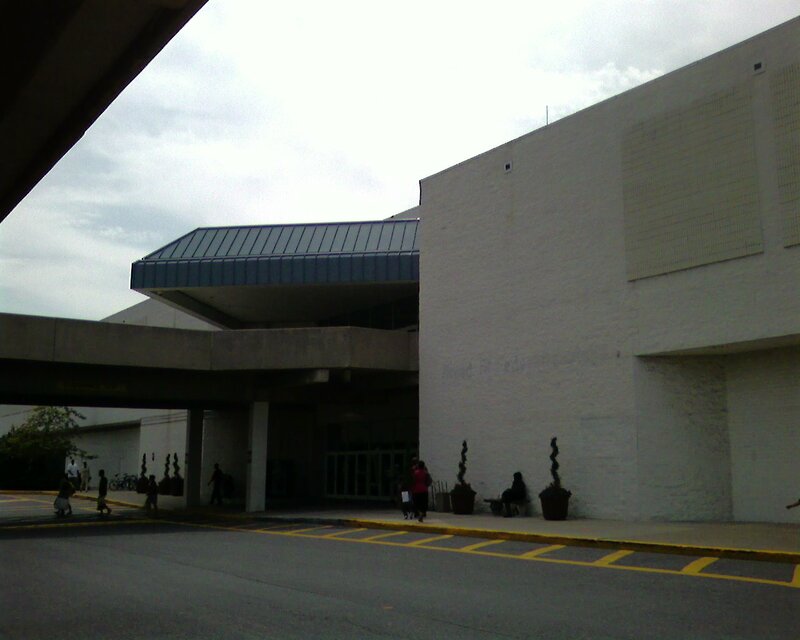 I grew up in the Adelphi/Beltsville area, so Laurel Mall has been a large part of my life. When I was a kid, my mom would park on the shopping center side so we could enter the mall through the skyway next to Woolworth’s (after poking around IN Woolworth’s of course!). You could get everything there, and we always stopped at the food court afterwards. There was the giant fountain there (it became an enormous planter in the late 90’s, I think), and I loved being able to pick my lunch from the wide variety there and ending it with an orange sherbet cone from the ice cream place! When I was a teenager, the mall was THE place to hang out! We took a fiendish delight in punking our friends with the sour gumballs you could get at the candy shop and laughing ourselves sick when the unsuspecting chewer’s lips tried to crawl down his/her throat at the sour taste, and I earned many tickets at the video arcade playing Skee-Ball ( never did redeem them before it closed-stupid). The last time I went there was in 2002 when my older daughter was four months old. It was still bustling a bit, but you could see it was starting to lose its edge. Since then, I’ve heard about the sharp decline the mall has suffered, and it is extremely depressing. So many of my favorite “haunts” growing up have either been sold out, closed down, built over, or burned down, and it looks like the mall will join the memories in my mind. The last time I visited PG County was in December of 2010, and after seeing all that had changed and been built up in the Beltsville/College Park corridor of Route 1, I had no desire to visit Laurel and depress myself even more. For the first time in my life, I couldn’t wait to get the hell out of there! I don’t plan on going back to the mall and seeing how it’s basically a ghost mall now. Better to keep those fond memories from my youth intact and remember the mall in its prime. Thanks for the updates on the mall. I lived in Laurel for the first 24 years of my life and haven’t been back in quite a while. One small correction, though. The mall actually opened in 1979, not 1977. I believe it was the fall of 79. I remember being there for the grand opening with several of my friends. It’s a shame about what happened at Laurel Mall because there was a time when I used to shop there on a regular basis because it had some really lovely stores. I think the owners should either make a new effort to attract new tenants or just shut the whole mall down because it’s pretty ridiculous for shoppers to walk around empty corridors like that. @Kim, Wow! That’s depressing. Weren’t they supposed to have a large renovation/remerchandising project? The mall is still supposed to be remodeled. It’s been bought by another company that I can’t recall the name of at the moment; Somera is, I believe, no longer in the picture. According to the Laurel Leader, there have been new anchor stores lined up and the demolition phase of the renovations are supposed to begin “soon”, though no date has been given. I grew up in Laurel, moved away for a time, and now am living in Laurel again. I remember when the mall first opened, and how exciting it was. I was 12 or so at the time. The state it is in now is sad. I do know that for me, once the parking lots started collapsing, I pretty much stayed away. I hope the new renovations do start soon, but I’ll believe it when I see it. Greenberg Gibbons, Somera Capital Management and AEW Capital Management broke ground for the Towne Centre at Laurel, a $130 million redevelopment of Laurel Mall in Owings Mills, Md. The redevelopment will transform the 31-year-old enclosed center into a mixed-use project combining 400,000 sq. ft. of retail with 435 residential units. @mallguy, Vornado is redeveloping Springfield Mall & Lerner is doing the same for white Flint. Both projects are designed to be more transit oriented & contain mixed uses. Each redevelopment spans a decade or more. @SEAN, I heard about both and with their locations next to major points of transportation, that will help! When Bloomingdale’s announced their closing at White Flint, I knew the redevelopment wasn’t too far off. I always liked White Flint – was the first place where I experienced Cheesecake Factory and Dave & Busters. @mallguy, Was the “mixing bowl” construction ever completed in Springfield? As for the redevelopment, I think that the Lerner project has a better prospect as Bathesda has better transit infrastructure than Springfield does at this point. Having said that, it doesn’t get WMATA, Fairfax County Transit or Montgomery County Ride On off the hook for sub par service in places or delays in implamentation of the BRT network in Ride On’s case. Also both projects need to seriously improve the sidewalk infrastructure to make any new developments a success as 24-hour foot traffic is esential. @SEAN, Yes, the mixing bowl at 95/495/395 is complete and they are working on completing the High Occupancy Toll lanes on 495 between the mixing bowl and Dulles Toll Road. The Metro actually comes close to both; the blue line terminating at Springfield/Franconia and White Flint being right along the Red Line. @mallguy, I knew about the Red Line, but wasn’t sure on the Blue Line in Springfield though. Since the mixing bowl is close by, I must ask… who wants cookies! 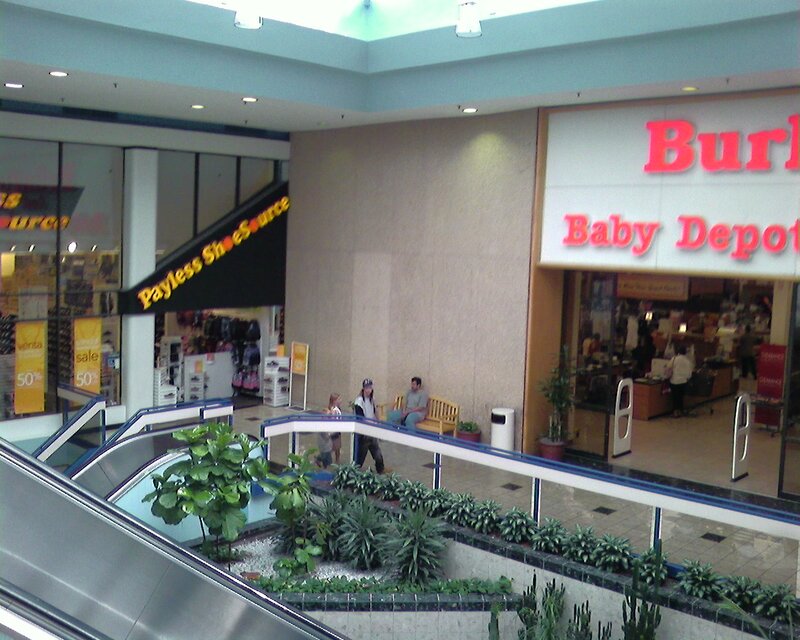 Isn’t it interesting that in the DC area malls are moving towards one of two extremes. They are dead/ troubled or part of some form of Transit Oriented Development. Notice that Laurel Mall is clearly in the former while Tysons Corner is transitioning towards the latter & both White Flint & Springfield will move towards the latter as well after being in the former for some time. Now look at Arlington VA where the malls were built with some degree of TOD principles, even though that term wasn’t technicly invented yet. But it was part of the counties masterplan & has been updated to what we see there today. @mallguy, I’m going to add this 1-hour video on Arlington VA & it’s smart growth program. This program will answer what malls like Laurel can do to remain vibrent. @SEAN, That’s why Ballston, Clarendon, etc were built…Metro accessiblity. And when the Silver Lines gets to Tysons Corner and eventually Reston, you’ll see even more growth to those already dense areas! @mallguy, How much developable acreage is there in Tysons Corner? I would assume there must be alot as the time horizon spans 20-years for build out, although the original plan went out 40-years. Fairfax voters & polititions couldn’t mentally rap themselves around a 40-year timeframe for development despite having Macerich, Ketteler & other known real estate companies who are fixtures in metro DC. I wonder if the office building owners along with the two Tysons malls will cooperate in creating a more padestrian friendly transit village connected to the Silver Line. One of the interesting issues lies in the fact that both malls have Macy’s & only one store is nessessary as both malls are yards apart. Now, where is each mall in relation to the metro station? What I’m trying to figgure out is how connecting walkways could be constructed to make padestrian movement easier especially in bad weather & durring the holidays, as the road network is as unfriendly to padestrians as possible. @SEAN, There is actually very little open space in Tysons Corner and a lot of where these new building may go could be on the parking lots, thus requiring underground parking or decks. Any undeveloped green space is in the office park where the Hilton is, northeast of the Galleria. The Tysons 123 station (might have since changed the name) is going to be on the north side of Chain Bridge Road on a portion of the undeveloped land between the highway and Tysons Galleria. There will be pedestrian walkways over Chain Bridge Road to Tysons Corner Center, as well as to Tysons Galleria over Galleria Drive. Very few Tysons Corner-like communties aren’t very pedestrian friendly…I learned this in Buckhead walking between Lenox Square and Phipps Plaza…not enough time to cross the wide streets between the malls. Down there, at least MARTA can get you to the area. @mallguy, I should have been clearer. Whhen I was refering to acreage, I included all office building & mall surface lots as well as greenspace.